132 BAL HARBOUR When the first golf ball soars over the greens at Minnesota's Hazeltine National Golf Club on September 27, spectators at the Ryder Cup—golf's most prestigious team competition—will be treated to more than just the highly anticipated face-off between the U.S. and European teams, at what is believed to be the third most widely viewed sporting event in the world after the Olympics and the World Cup. The European team, including captain Darren Clarke, will be sporting chic new uniforms designed and crafted by the inimitable Italian luxury goods house Loro Piana. The elegant, performance-level uniforms include a sweater and vest made from feather-light cashmere, a polo shirt in lightweight wool piqué ergonomically designed to follow body lines, and pants with a waterproof finish. 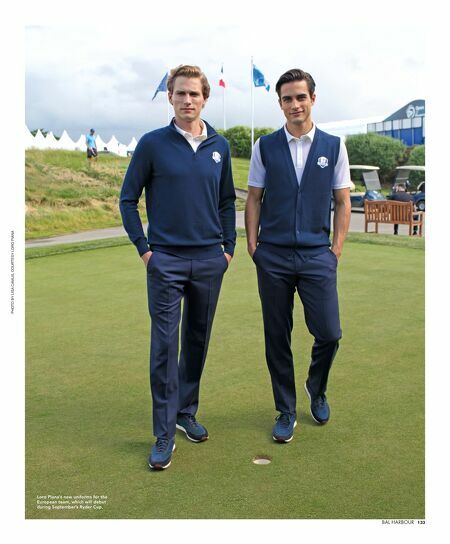 At the June 30 announcement of the partnership, Antoine Arnault, chairman of Loro Piana and the son of LVMH chairman and CEO Bernard Arnault, spoke about the authentic laboratory that Loro Piana has created in partnering with sporting events like the Ryder Cup. "We are very proud and honored to represent the European team at the Ryder Cup," he said. 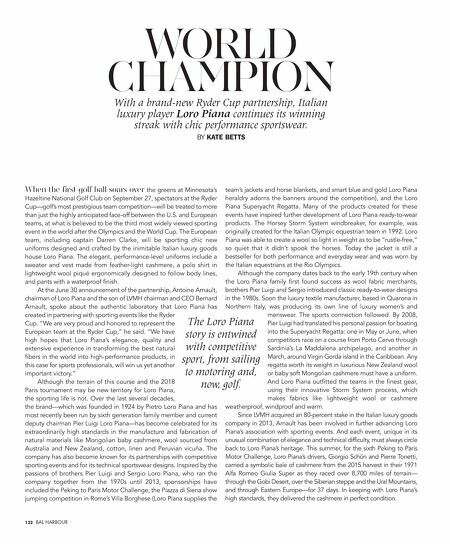 "We have high hopes that Loro Piana's elegance, quality and extensive experience in transforming the best natural fibers in the world into high-performance products, in this case for sports professionals, will win us yet another important victory." Although the terrain of this course and the 2018 Paris tournament may be new territory for Loro Piana, the sporting life is not. Over the last several decades, the brand—which was founded in 1924 by Pietro Loro Piana and has most recently been run by sixth generation family member and current deputy chairman Pier Luigi Loro Piana—has become celebrated for its extraordinarily high standards in the manufacture and fabrication of natural materials like Mongolian baby cashmere, wool sourced from Australia and New Zealand, cotton, linen and Peruvian vicuña. The company has also become known for its partnerships with competitive sporting events and for its technical sportswear designs. Inspired by the passions of brothers Pier Luigi and Sergio Loro Piana, who ran the company together from the 1970s until 2013, sponsorships have included the Peking to Paris Motor Challenge, the Piazza di Siena show jumping competition in Rome's Villa Borghese (Loro Piana supplies the team's jackets and horse blankets, and smart blue and gold Loro Piana heraldry adorns the banners around the competition), and the Loro Piana Superyacht Regatta. Many of the products created for these events have inspired further development of Loro Piana ready-to-wear products. The Horsey Storm System windbreaker, for example, was originally created for the Italian Olympic equestrian team in 1992. Loro Piana was able to create a wool so light in weight as to be "rustle-free," so quiet that it didn't spook the horses. Today the jacket is still a bestseller for both performance and everyday wear and was worn by the Italian equestrians at the Rio Olympics. Although the company dates back to the early 19th century when the Loro Piana family first found success as wool fabric merchants, brothers Pier Luigi and Sergio introduced classic ready-to-wear designs in the 1980s. Soon the luxury textile manufacturer, based in Quarona in Northern Italy, was producing its own line of luxury women's and menswear. The sports connection followed. By 2008, Pier Luigi had translated his personal passion for boating into the Superyacht Regatta: one in May or June, when competitors race on a course from Porto Cervo through Sardinia's La Maddalena archipelago, and another in March, around Virgin Gorda island in the Caribbean. Any regatta worth its weight in luxurious New Zealand wool or baby soft Mongolian cashmere must have a uniform. And Loro Piana outfitted the teams in the finest gear, using their innovative Storm System process, which makes fabrics like lightweight wool or cashmere weatherproof, windproof and warm. Since LVMH acquired an 80-percent stake in the Italian luxury goods company in 2013, Arnault has been involved in further advancing Loro Piana's association with sporting events. And each event, unique in its unusual combination of elegance and technical difficulty, must always circle back to Loro Piana's heritage. This summer, for the sixth Peking to Paris Motor Challenge, Loro Piana's drivers, Giorgio Schön and Pierre Tonetti, carried a symbolic bale of cashmere from the 2015 harvest in their 1971 Alfa Romeo Giulia Super as they raced over 8,700 miles of terrain— through the Gobi Desert, over the Siberian steppe and the Ural Mountains, and through Eastern Europe—for 37 days. In keeping with Loro Piana's high standards, they delivered the cashmere in perfect condition. WORLD CHAMPION With a brand-new Ryder Cup partnership, Italian luxury player Loro Piana continues its winning streak with chic performance sportswear. BY KATE BETTS The Loro Piana story is entwined with competitive sport, from sailing to motoring and, now, golf.